The efforts of researchers working through the Next Generation Cassava Breeding (NextGen Cassava) project to significantly increase the rate of genetic improvement in cassava breeding and unlocking the full potential of Africa’s most popular staple crop were applauded by Bill Gates, founder of the Bill & Melinda Gates Foundation in his blog this month. Millions of African households depend on cassava for their livelihoods. “In the developed world, most people eat the root vegetable cassava only in tapioca pudding or bubble tea. But in Africa, it’s the primary staple for half a billion people and the continent’s most popular crop. That’s why I’m super excited that scientists are using the most advanced hybridization techniques for the benefit of cassava farmers and those who depend on the crop. With the support of UK Department for International Development and our foundation, scientists are making great progress developing hybrids that are resistant to the major virus that cuts down on cassava yields (cassava mosaic virus). At the same time, these scientists are breeding strains that have more nutrients than the strains under cultivation today”. The NextGen Cassava project uses genomics to breed varieties that will respond positively to most of the “sensitivity” issues exhibited by the crop in the region. 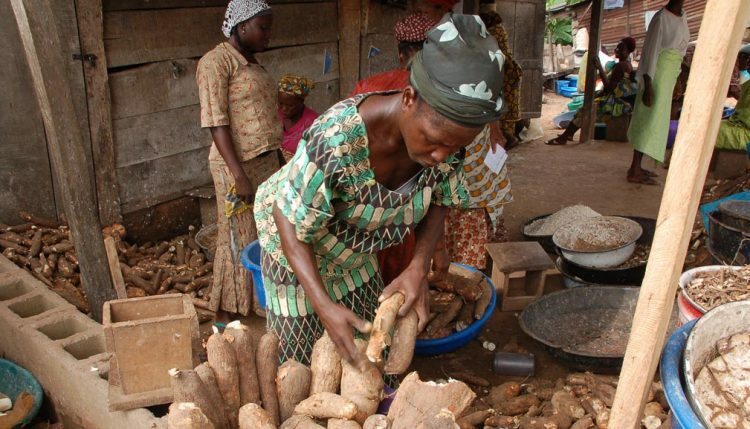 Earlier last year, The Economist featured a report on Chiedozie Egesi, IITA scientist and researcher at the National Root Crops Research Institute (NRCRI), Umudike, Nigeria, who leads the NextGen Cassava project. The report detailed some of the progress on the crop as highlighted during the meeting of the American Association for the Advancement of Science (AAAS), in Washington, DC. NextGen is led by International Programs in the College of Agriculture and Life Sciences at Cornell University, in collaboration with IITA, NRCRI, the National Crops Resources Research Institute in Uganda, Tanzania’s Ministry of Agriculture, Livestock, and Fisheries, the West African Centre for Crop Improvement in Ghana, Makerere University in Uganda, the Boyce Thompson Institute, USDA-ARS, and the US Department of Energy in the United States. The project is supported by the Bill & Melinda Gates Foundation and the UK Department for International Development.